The Aggravation board game is sure to give players many fun filled hours as they race their marbles to the finish line while aggravating each other. Originally marketed in 1962 as a game for children, families soon realized that everyone enjoyed playing the fast paced, roll and move marble game. Before the introduction of the Aggravation game by the CO-5 Company of Benton Harbor, Michigan, families in the Appalachian Mountains and Southwestern parts of the United States played the game Wahoo on handcrafted wooden boards. A member of the cross and circle family of games, Wahoo is generally a very strategic and intense game. When Aggravation was introduced by CO-5, it was based on a simplified version of Wahoo and played with Parcheesi style rules. The original classic edition of the board game Aggravation was made for 2-4 players and included beautiful glass marbles in four colors. Deluxe Aggravation changed the game board to include two additional players making the game for 2-6 players. Later regular editions of the Aggravation game boards were made for 2-6 players. In 1971 the Lakeside company introduced a split level edition of the game. In 1980 Lakeside introduced a travel edition of the game. Although the rules of the game are the same, newer editions of the Aggravation game board are different from the older editions. On older game boards, the playing field is formed in a symmetrical shape similar to an asterisk. On the newer editions of the game, there are still the same number of spaces for each player, but the symmetry of the game board has been replaced with different shapes and irregular patterns for each of the players. 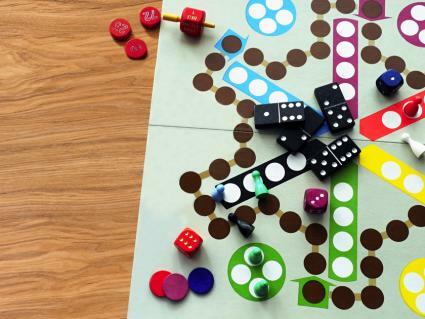 Wooden Aggravation game boards with their beautiful colored glass marbles and symmetrical design make lovely decorative conversation pieces when displayed on a coffee table, game table or low shelf. However, if there are young children in the house, use caution as the marbles can be swallowed. Many people enjoy playing older versions of Aggravation. For some it is the nostalgic memories of the game they played in their younger days, for others it is a great yard sale find for family game night. Vintage versions of Aggravation are usually offered on Bonanzale and Amazon.